The story goes like this: in the early 1900s Japanese beetles were accidentally introduced into the American ecosystem via shipments from Japan. Mostly isolated to the Eastern and Midwest regions of the U.S., these green and copper-colored beetles have very few natural predators in our country, which has led them to become one of the most widely spread and damaging garden pests. Most active during the warmest summer months (mid June to late August for adults, fall and late spring for larvae), these beetles and their larval grub form can wreak havoc on your lawn. The adult beetles “skeletonize” nearly all forms of plant life, while their younger grub counterparts consume grass and other roots from below the soil. Because Japanese beetles eat in groups and feed from both above and below the soil, they can devastate entire lawns & gardens in no time. If Japanese beetles are destroying your lawn, or you’re just looking for ways to keep that from happening in the first place, here’s 10 All Natural Ways to Get Rid of Japanese Beetles. The tried and true method of hand picking Japanese beetles from your lawn & garden is still the most effective approach to controlling these pests. It can take some time, but the effect it can have on the health of your plants is well worth the effort. For best results, do this in early morning, when Japanese beetles are most active. Using gloves, pluck the beetles from grass and other plant life being careful not to squeeze or crush them (doing so could attract more beetles). Dispose of them by dropping them in a bucket of soapy water (2 tablespoons of liquid dish soap per 1 gallon of water)—this is one of the most humane ways to eliminate Japanese beetles. Keeping guinea fowl around your lawn & garden is a proven way to limit not only Japanese beetle populations, but that of ticks and other pests as well. However, not everyone wants to keep these loud birds as pets. In that case, finding ways to attract ducks and other birds to your yard will do the trick. Spraying your entire lawn with a soapy mixture of 2 tablespoons dish soap to 1 gallon of water will help force Japanese beetle larvae to the surface, which in turn will attract hungry birds (this should be done in fall and late spring, when Japanese beetles are in the larval stage of their life cycle). Continue this process weekly until no further larvae emerge from the soil. Japanese beetles are most attracted to rotting and overripe plants, so keeping a healthy lawn & garden is key. Promptly remove diseased or otherwise dying plants, trees, fruits and vegetables before they attract additional beetles to your yard. Harvesting plants before they become appetizing to beetles is important also. Row covers allow air, sun, water and other essential elements to reach your plants while keeping Japanese beetles out. Remember: To remain effective, the edges of the cover must be flush with the ground, or otherwise firmly sealed. If Japanese beetle grubs have already infested your soil, this method is not for you, as it will only serve trap the beetles inside the cover with your plants. One of the greener options for Japanese beetle control involves introducing parasitic roundworms into the soil. Also known as beneficial nematodes, these organisms can devastate soil-dwelling pests like Japanese beetle larvae. Once they’ve located and entered a host, these nearly microscopic worms release a bacteria that’s deadly to the young beetles. After killing their host they move on to another beetle, reproducing in the process. For best results, introduce nematodes into your soil in late August or early September to attack the next cycle of beetles for the following year (while this is the optimal approach, nematodes can be added to the soil at any time, so long as the soil is sufficiently watered). Note: the nematode species Heterorhabditis is said to be most effective against Japanese beetles; the nematode pest control method targets larvae, not adult beetles. Beneficial nematodes can typically be found at your local home & garden store. While Japanese beetles enjoy eating a wide array of plant life, certain types are particularly attractive to these devastating pests. Inundating your garden with Japanese Beetles’ favorite food sources is just asking for trouble. Limit installing such plants as much as is reasonably possible. For a list of Japanese beetles favorite meals, click here. Drop cloths can be highly effective at cutting down Japanese beetle populations. At night, cover your plants with a sufficiently large drop cloth. In the morning when beetles are most active, remove the cloth and dispose of the attached beetles using the aforementioned bucket of soapy water. Most Japanese beetle traps are ineffective, usually only serving to attract additional beetles to your lawn & garden. However, a can of fruit cocktail can quickly remove active beetles from your yard. First, ferment the cocktail by leaving it in the sun for a few days—this will make it more attractive to beetles. 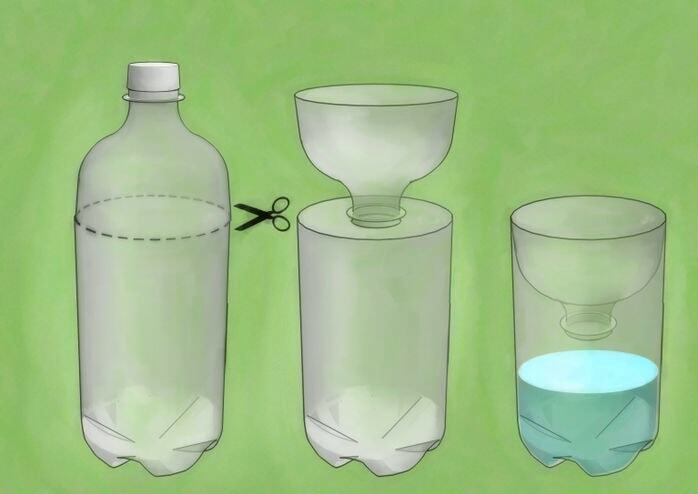 Next, place the can on top of a brick or bricks stacked inside a pail filled with water (it’s advisable to keep this trap far removed from the plants you’re trying to protect). The cocktail will attract the beetles, the water will drown them. It’s that simple. Mix 4 tablespoons of dish soap with water inside a spray bottle. This simple solution makes for a great, all natural Japanese Beetle pesticide. Spray on any beetles you see on or around your lawn & garden. Vet’s Choice Vs. DAS Whats the Difference? At Cedarcide, we offer several pest-control solutions for both indoor and outdoor use. From concentrates to ready-to-use formulas, from personal & pet use to lawn & garden care, we have what you need to keep your home, yard and animals free of pests. But which products are right for you? To make your shopping experience easier, we’re launching a series of blog posts to help you better understand the differences between our most popular formulas. Today we’re talking about our two all natural pet & livestock solutions: Vet’s Choice and D.A.S. Vet’s Choice is an extra strength, all natural and highly versatile concentrate designed to control insects and parasites commonly found on pets and livestock. Vet’s Choice eliminates and repels fleas, ticks, mosquitoes, flies, mites, gnats, ear mites and dozens of other biting insects. Vet’s Choice can be mixed with water for use as a bath, spray or dip. Vet’s Choice can be used in stables, barns and kennels to reduce flying insects, or used as a treatment for mange, hot spots and other animal skin disorders. DAS (Domestic Animal Spray) is an all natural and highly versatile solution designed to control insects and parasites commonly found on pets and livestock—think of it as a ready-to-use version of Vet’s Choice. Like Vet’s Choice, DAS is ideal for use in stables, barns and kennels to reduce flying insect populations, and can be used as a bath, spray or dip. DAS eliminates and repels fleas, ticks, mosquitoes, flies, mites, gnats, ear mites and dozens of other biting insects; it can also be used to treat mange, hot spots and other animal skin disorders. To use: DAS works best when animals are thoroughly wetted with the product and then allowed to air dry. Apply directly to your animal’s skin or simply add it to their bath for lasting protection against pests. For additional protection and prevention, dilute DAS with water at a 3:1 ratio and apply to your pets’ bedding using a spray bottle. DAS is simply a ready-to-use, pre-diluted version of Vet’s Choice. Vet’s Choice contains 90% cedar oil; DAS contains 3% cedar oil. Who Should Buy Vet’s Choice? Those treating many animals—such as in agricultural use or for facilities like animal rescues—should choose Vet’s Choice because it’s concentrated, meaning it will last longer than the same amount of DAS. Vet’s Choice is also more customizable, allowing customers to dilute the solution to whatever concentration they prefer. Those looking for a quick and convenient solution to protect pets or livestock from biting insects. While Vet’s Choice will last longer because it’s concentrated, DAS is easier to use, with less need to dilute. Of all the pests people hate to see in their homes, cockroaches are right at the very top—and for good reason. While they don’t regularly bite or sting like other household pests—such as bed bugs, ants or fleas—roaches can be extremely bad for your health. In addition to worsening symptoms in asthma sufferers, roaches are known to carry over 50 different pathogens, including pneumonia, meningitis, salmonella, staphylococcus (staph infection) and streptococcus (strep throat). In other words, if you have roaches, you need to get rid of them as soon as possible. The smallest crumbs and spills can feed a roach for weeks, even months. Cleanliness needs to be a top priority. Floors, counter tops, flooring, appliances, cabinetry, sinks, dishes, back splashes—your entire house needs to be clean and free of food debris at all times (don’t forget to clean behind appliances!). We find natural disinfecting wipes help speed up the cleaning process. Roaches use clutter—especially stacks of paper—to both hide and breed. Every instance of clutter is a roach nest just waiting to happen. If you’re experiencing a roach infestation, you need to keep your home as clean and free of clutter as possible. As far as outside, wood piles, brush, yard clippings, moist mulch, lawn equipment and furniture are all possible roach homes, and should also be removed. Leaving unsealed food out in the open is an easy way to invite roaches over for a meal. From leftovers to dry items like cereal, all the food in your home needs to be sealed. If you have an active roach infestation, this includes unexpected things like pet food and fruit bowls, too. Ziplock bags work, but hard plastic Tupperware-like containers are even better. Make sure the outside of your sealed containers are free of sticky residues and food debris, too. And always thoroughly wash and rinse bottles and cans before recycling them—roaches are attracted to any residual sugar, no matter how small the amount. While roaches can sometimes go weeks to months without food, they can go only a few days without water. A single drop of water can sustain a roach for several days. So, successfully ridding your home of excess moisture is essential to eliminating a roach infestation. Never let water sit for prolonged periods of time, such as in sinks, potted plants, and pet dishes. It’s also important to address the following areas of concern: leaking plumbing, sinks, bathtubs, basements, crawl spaces, A/C units, appliance drip trays, and attics. In the case of severe infestations, you might need to wipe down your shower and sinks regularly to avoid even the smallest sources of moisture (damp rags, towels and sponges should not be left out, either). Trash cans are a buffet for roaches. To prevent and repel these pests, you’ll need to take out the trash daily. Trashcans should also remain firmly sealed at all times, and be cleaned regularly to limit food debris and other residues. While necessary, weatherstripping windows and doors only goes so far. When it comes to roaches, you have to be diligent, and go even further—no crack, crevice or hole can go unsealed. In this regard, caulk is your best friend. Indoors: fill any cracks/holes in cabinets, pantries, counter tops, piping, walls, ceilings, attics, crawl spaces, basements, under sinks, floorboards, and anywhere else roaches could enter your home. Outside: fill any cracks in foundations, roofing, and the exterior walls of your home. It’s advisable to use plugs or stoppers to seal drains, sinks and bathtubs when not in use, too. A mixture of 30% peppermint oil to 70% water makes for a natural, non-toxic indoor roach repellent. Spray floors, counter tops, cabinets, window sills, doorways, and other problem areas to deter roaches. Cedar oil works, too. Have catnip lying around? If so, you’re in luck: catnip is another natural roach repellent. In 1999, Researchers at Iowa State University discovered that catnip—specifically a chemical in catnip called nepetalactone—successfully repels roaches. There are several easy but highly effective roach traps you can make at home. They all work on the same basic premise: (1) bait the bottom of a container (like a bottle) with something that will attract roaches (like sugar, fruit or bread), and (2) make sure to build the trap in such a way that roaches can easily enter the container, but not escape. This last feature can be done by lining the walls of the container with something slippery like petroleum jelly, or by creating a funnel at the top of the container. Place these traps in high traffic roach areas and leave them overnight. Continue this approach until you no longer capture additional roaches. Many experts advocate using a boric acid mixture to bait and kill roaches. While this approach is effective, it also poses health risks to pets and children. To avoid these risks, we advise using a 50/50 natural mixture of baking soda and sugar. Thoroughly mix the two ingredients and sprinkle the bait around roach problem areas and suspected entrance points—like windowsills, baseboards and doorways. Continue using this method until your roach infestation disappears. How Do Bugs Survive Winter? Have you ever wondered how bugs disappear in winter and then emerge so quickly in spring? Most people think that bugs either migrate or die during winter. What they don’t realize is that many insects continue to live among us during colder months. Many species such as butterflies, dragonflies, moths and beetles migrate in large groups to warmer areas during the winter. Distance depends on species but some have been known to travel several thousand miles. Some insects such as bees, ants and termites practice communal living in order to survive on stored food and a colony for support. Most insects seek shelter in the winter. This could be something such as a brush pile, a hollow log, a dog house or your home. Many insects have developed strategies for surviving harsh conditions including controlling their body’s ability to freeze. Similar to hibernation, some bugs enter a paused period of development called Diapause. This allows them to slow their metabolism and become inactive. This can take place in insects at all life stages and some larvae can freeze and then resume developing when temperatures rise. The best way to keep bugs from entering your home is to make sure to block all possible entry points. Doing a thorough perimeter check around you home at least twice a year is good practice for bug prevention. Note: Only you know your home, be sure to check any additional areas that could be a threat. What kind of bugs are most common inside the home? Fleas are one of the most common pests that we get calls about during winter. If fleas are able to live indoors they will continue to multiply in your home. Performing regular flea checks on your pets as well as using natural preventatives is key in keeping fleas from becoming a problem. Do you stack firewood near your home? If so, you could be inviting wood boring bugs to your home. Make sure that you do not store wood inside your home and only bring it indoors when you are ready to use it. This will keep bugs that have been harboring in the wood from escaping inside your home. Even though it’s year round, pest prevention should be easy. Knowing how to keep them out and what to use when you do see one is what’s most important. The best way to avoid encounters with pesky bugs is to take preventative measures. Use these tips to reduce unwanted pests. Insects find overgrown areas to be a perfect place to call home. Mowing regularly and removing debris from your yard is one of the first steps you should take in bug-proofing your home. Treating your lawn with a natural pesticide and insect-repelling mulches will also stop and prevent future infestations. Mosquitoes rely on water for both feeding and breeding. Remove standing water from trash cans, pots, furniture, buckets, etc. If you have birdbaths, be sure to change the water every 2-3 days. If you cannot remove the standing water, add a small amount of PCO Choice to the water in order to repel mosquitoes from breeding there. Regularly removing debris and leaves from gutters and drains is also important as insects will often hide in these areas. It’s good practice to annually check your doors and windows for cracks or openings. Bugs (and other critters) look for places like this to gain access to your home. A simple weatherstrip or door sealing kit can often do the trick if you find openings. Also, spraying your doors and window seals with an all-purpose repellent will deter them from entering your home. For a number of reasons including food and shelter, bugs love trash cans. Regularly wiping down your trash cans and spraying an all-natural repellent will significantly cut down or eliminate this problem. One of the quickest ways fleas and ticks enter your home is through your pets. Spraying your pets with natural flea & tick spray before going outside is a safe way to keep fleas and ticks away. Avoid heavily wooded areas during peak tick season and always do a tick inspection after outdoor activities.